Michael McFadyen's Scuba Diving - Indian Point Botany Bay is located just to the south of Sydney Harbour. As most Australians would know, this was the location where Lieutenant James Cook, RN, first set foot in our country in 1770. Almost 18 years later, Captain Arthur Phillip, RN, entered the same bay with the ships of the First Fleet. After only a couple of days, Phillip decided that Botany Bay was not a suitable location to establish the new colony. On the morning of 26 January 1788, he set sail with his ships for Sydney Harbour and that same day, started the colony of New South Wales. Despite what Phillip thought of Botany Bay, scuba divers know that the waters of the bay contain some amazing creatures that were unknown to Europeans. Today, Botany Bay has what are probably the two most popular dive sites in Sydney, Bare Island and Inscription Point. As well as these sites, the headlands of the bay, Cape Banks and Henry Head on the north and Cape Solander on the south have great dive sites as well. One area of the bay that I have always wanted to dive but have never gotten around to until mid-2001 was the section of the inside northern headland between Henry Head and Little Congwong (Little Congie) Beach. For people who have visited La Perouse to dive Bare Island, this is the section of land to the east of Bare Island. The reason I had never dived it was that it is a very long and difficult walk from the carpark on Anzac Parade to the natural starting point. The option of a boat dive was not really an option as until recently, no dive boats operated out of Botany Bay and even if they did, it is unlikely they would want to dive there. Even though I have my own boat, it seems a waste to do all the work in launching etc and only go to a spot a few hundred metres from the nearest carpark. However, in 2000, together with my friend Les Caterson, we purchased two Apollo underwater scooters. These open up areas to diving that I would have never even considered doing as a shore dive. Since then I have been trying to explore some of these to see if they are any good. In the February/March 2000 issue of Sportdiving magazine (pages 82 to 86), Akos Lumnitzer wrote an article on dive sites in Sydney's eastern suburbs that were rarely dived. One of them was Indian Point and his descriptions made me more determined to dive there. I have used his name for this site in recognition of his promotion of the dive site (just as he used my name of Mahon Pool for the North Maroubra dive). I have now dived here twice, once using the scooters and once using my boat. The best way to dive here would be to dive from your boat. Try GPS Reading of 33° 59" 43'S 151° 14" 04'E (using AUS66 as datum - see my GPS Page for info on what to do if you use another datum) and anchor when the bottom comes up from 15 metres to say 9 metres. If you are really keen, you can do this as a shore dive as follows. Travel to La Perouse and when you arrive at the Snake Pit (opposite the bus terminus), park to the south of the Snake Pit in the carpark. This is right above the steps to Congwong (Congie) Beach. Once geared up, walk down the stairs and across the beach. You could walk around the rocks to Little Congie (I am not sure if the walking track provides access to this beach, probably not, as Little Congie is a gay nudist beach). An alternative would be to enter the water near the eastern end of Congie Beach and, taking a bearing on the rocks opposite, swim on the surface and underwater to that location. Using a scooter with no kicking, it took me 7 minutes from the western end of the beach, so I guess about 10 to 12 minutes from here under human power. If you walk across the rocks, cross Little Congie and enter the water at the southern end. From Congie, the bottom is sand all the way across, the depth getting to 6.5 metres or so (at high tide) at the reef's edge. Once you meet the reef, turn right and follow the edge to the south. At first the reef is low and runs a bit to the west. After 30 metres the sand gets deeper and the reef is far more prominent. You will start to find sea dragons on the sand and, according to Akos, Red Indianfish on the rocks (I do not dispute this as I have seen one at nearby Henry Head). Further south, the depth of the sand drops to over 15 metres (at high tide) and the reef above is 9 metres or less. The wall here is almost vertical. After a while, the reef turns east and runs right back in towards the land. Along this section there are more than 13 small gutters or cracks that run north-south. These do not go far from the reef edge, but they are home to small rays, sea dragons and, in Winter, Port Jackson sharks. We have also seen big belly sea horses, sea dragons and even a turtle here. I guess that by this time you will have been down for about 30 minutes at a minimum and getting low on air. Turn around and head west and then north, following the top of the wall. You should especially look for red Indianfish as you go. In the shallows, there are large schools of surgeonfish, yellowtail, seapike as well as quite a few bream and luderick. I have also seen thousands of small moasic leatherjackets schooling here. 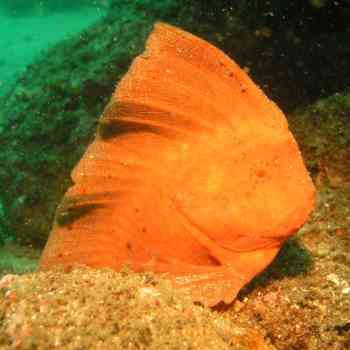 There are a lot of black reef leatherjackets around and many large blue gropers. Akos says that there are also sea horses to be seen here. Once back near the largest wall, there are some large rock outcrops on the top of the reef that have small overhangs, providing homes to small cuttlefish and other cave dwelling species. It is probably time to head back now, so return to the low reef edge where you first met the reef. Head off on a reverse heading for the swim back to Congie Beach. You could also do this even if you have walked to Little Congie and have spare air. You will also see more anchors and bottles on this dive than you will see on any other Sydney dive. Some of the bottles date back to the 1940s or earlier. As a shore dive, this is only suited to fit persons and divers who are good on their air. If you do from a boat, then you will have a lot more time to explore the reef, I am sure that there is more to see than I have so far seen. In summary, a very good dive site, almost as good as Bare Island!